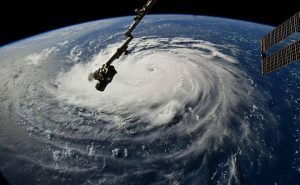 North Carolina’s Governor Cooper says residents should plan to be without power for days, as Hurricane Florence is expected to make landfall early Friday and bring life-threatening storm surge and rainfall to the Carolinas. While electrical power may be unavailable, we have a greater power at hand that we should learn how to harness. As I have been saying for many years, we live in a single, integrated system. It’s hard for us to recognize that all layers of nature are interconnected and interdependent. From earth’s plants and minerals to human thought and behavior, and everything in between. Within the natural system, humans make for a highly qualitative element, and the way we relate to each other has impact on all the other layers of nature. It is an indirect, and intricate influence. But just as it’s hard for us to identify, so it is vital for nature’s balance. We don’t fully understand how and why earth’s tectonic plates are shifting after millions of years, earth’s mantle incorporates volatile compounds from the atmosphere, and radiation is coming from the belly of the planet. But if we saw the inner workings of nature’s system, we would see how much of it relies on human relations. We would see that nature’s law of balance and homeostasis must be kept on the human level as well. The planet is awakening and working to bring us into balance with each other and with the rest of nature. Rabash, “The Agenda of the Assembly 2”: To the extent that the society regards the greatness of the Creator with their thoughts during the assembly, each according to his degree originates the importance of the Creator in him. Thus, he can walk all day in the world of gladness and joy, meaning he enjoys every little thing that he does concerning the work of the Creator. This is so because if he remembers that he should contemplate spirituality for even a minute, he immediately says, “I am already grateful and praising and glorifying the Creator,” since he believes that now the Creator has called him and wishes to speak with him. We need to work not in our field, but in the field of the Creator. Then, there will be no problems. You are constantly concerned about making Him happy, like a mother who does not think about herself but about her child. If something happens to the baby, she is completely within it, not within herself. Blessing the Creator is the work in His field. Rabash, “The Agenda of the Assembly 2”: And when a person imagines that the King is calling him and tells him that he wants to play with him, what joy would he experience then, and what high spirits would he have? Certainly, in that uplifted state, he would not think any trifle thoughts. He would only be a little embarrassed at not knowing the King’s laws and manners—how to behave when the King speaks to him. At every moment I should try to think about how I influence the Creator through my present state: What do I bring Him in the given moment?